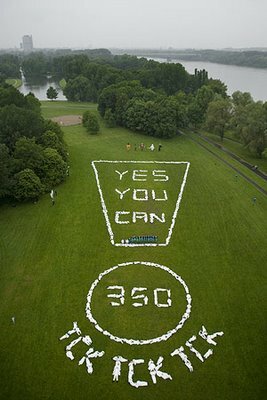 Five hundred climate activists gathered in a park field in Bonn, Germany on Saturday to stage a dramatic aerial image and send a message to the UN climate meeting that was taking place downtown. Unfortunately, you need to be up on environmental news and/or willing to do some sleuthing to decode the message. 350 and Tck Tck Tck are both climate activist groups. The former takes its name from what is considered the safe upper limit of CO2 in the atmosphere, as measured in parts per million. The latter from the sound of a clock. I hope the suits figured that out. Hopefully one day we will realise that the planet is not what needs saving, it will survive even us. We must learn to save ourselves from ourselves.